Ever notice how we get to fussing about things that are important, but still aren't the most important things of our faith. So often when we get to fighting the most important thing of all gets lost. In the first century, this fight often had to do with Jew/Gentile issues. While race, culture, and heritage are important, what really is most important is showing to the world that we can value cultural diversity in each other and still find our unity in Christ. 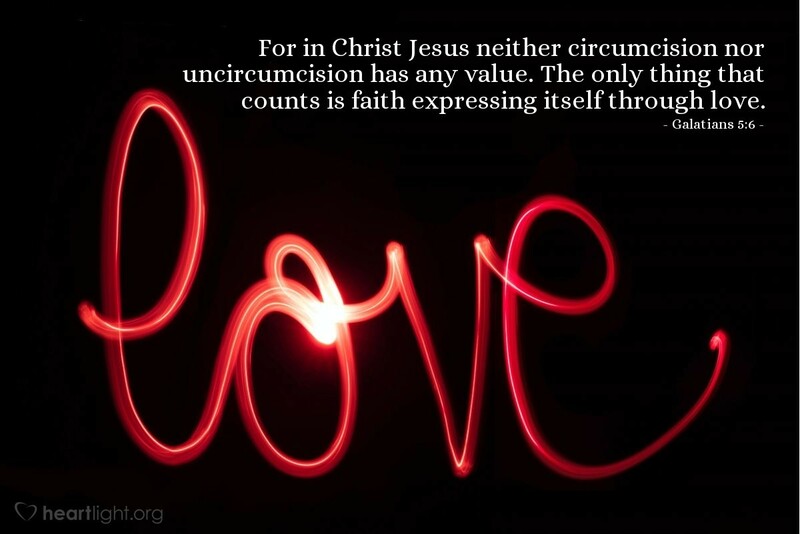 In our high tech world today, isn't it interesting that the most important issue is the same as it was two thousand years ago — faith displaying itself in loving action. Dear Lord, please help us tear down every wall that divides and separates your people. Forgive us for our pettiness and prejudice toward each other. Stir in us a deep longing to share the unity of heaven in our world today. In the name of Jesus, the atoning sacrifice for all the peoples of the world, I ask this. Amen.